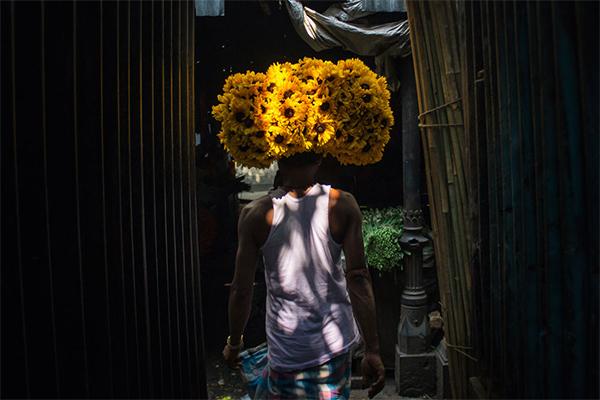 Location: Kolkata’s biggest flower market lies on the banks of the river Ganges, amidst the maze of small shops and houses, just below the famous Howrah Bridge. Moving image: The image is part of the photographer’s ongoing series titled Kolkata Jukebox that documents the city and tells stories of its people. This image is of a person carrying a bunch of sunflowers. The moment is ideal, because it captures the shadow of a tree falling on him, adding depth to an ordinary day in the life of a flower vendor. Buying these sunflowers may not be a necessity for us, but selling them is definitely a necessity for him. Photographer: Ritam Paul Chowdhury is a photographer based in Kolkata. He is also the co-founder of Cam2o Photowalkers (which is a group of street photographers in the city), and believes that street photography has a positive impact on society and an ability to bring about change.